Super Smash Con, a combination tournament and convention focused on the Super Smash Bros. fighting game series, kicked off this weekend’s festivities with a ridiculous show of skill known simply as the Combo Contest. Inspired by the NBA’s Dunk Contest, this exhibition invites some of the most creative Super Smash Bros. players to showcase the lengthy, flashy, and downright nasty combos they’ve come up with in the franchise’s inaugural Nintendo 64 release. Despite getting off to a relatively slow start, each player’s ingenuity was put on display as soon as the combo contest began. Eduardo “tacos” Tovar and Tomas “Kort” Keselik dropped the gauntlet early on, the former pausing to drop an item mid-combo while juggling his dummy opponent and the latter utilizing a glitch known as the “invisible bomb” to add a bit of flair to his aerial Link combo. The judges were fair, but stuck to a predictable pattern; where Super Smash Bros. pros like Yoshua “Dext3r” Peral Castillo, Daniel “SuPeRbOoMfAn” Hoyt, and Joel “Isai” Alvarado consistently gave lower scores on the 10-point scale due to their knowledge of the game, D’Ron “D1” Maingrette and Juan “Hungrybox” Debiedma were a bit more lenient with how they judged the entrants. The above Yoshi combo, for instance, received a score of eight from each judge in the former group, while the latter gave him a pair of nines. The real magic began when last year’s champion stepped up to the plate. Prince, a Japanese player known for his exquisite Yoshi combos, immediately went to work showing what the unassuming dinosaur can achieve in his capable hands. By using the lava underneath Super Smash Bros.’ Planet Zebes stage, Prince was able to effectively string together a handful of aerial attacks by bouncing the training dummy off the arena hazard. Naturally, the crowd went nuts. Prince’s dominance was a consistent theme throughout the entire contest. His next effort saw him pick up Metroid heroine Samus Aran and perform a bit of setup beforehand to ensure the most optimal combo. First, he charged the bounty hunter’s energy shot to its fullest, allowing him to hold it for later use. Then, he dropped two fan items into the stage, which can be used as melee weapons or tossed as projectiles. And finally, he waited until the Piranha Plant stage hazard was in the perfect position to juggle his training dummy. The result? We’ll just let the video below speak for itself. Even though he appeared primed to pick up his second straight combo trophy, Prince almost met his match in Mexican player Arturo “Mariguas” Núñez Hernández. After defeating Kort in a round three tiebreaker with a notoriously difficult Pikachu combo, Mariguas broke out fan favorite Captain Falcon for one of the event’s longest strings. However, dropping the combo on the very last hit likely affected his score with some of the sticklers on the judging panel, and Prince survived for one more round with another setup-heavy combo. While he couldn’t finish the combo to his own satisfaction, what Prince accomplished during the time limit was enough to carry him to the finals. In the end, everything came down to one more fantastic Prince combo. After Mariguas failed to showcase anything substantial with his time, Prince returned with a Pikachu display that put even his previous Yoshi combo to shame. By using the green tower on the Hyrule Castle stage, Prince bounced the training dummy repeatedly before allowing it to travel halfway across the stage. From there, all he needed to do was teleport to a small platform, send the opponent airborne, and land one final Thunder attack to seal the deal. Easy, right? 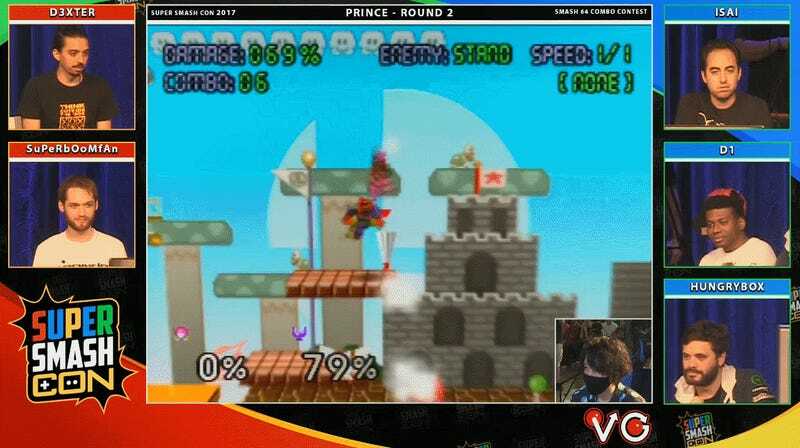 Prince’s final combo received an overall score of 47 out of a possible 50, the second-highest score after his first Yoshi combo, which was given a near-perfect 49. In fact, none of the other players were able to break even his lowest score over the course of the event, further cementing his legacy as one of the most creative Super Smash Bros. players in the world. This sort of event is something that could only be accomplished with Super Smash Bros. due to the way the series handles combos. Where games like Street Fighter, Marvel vs. Capcom, and Guilty Gear are loose enough that competitors can routinely combine crazy attack strings, Smash is often seen as the most freeform of the major fighting game franchises due to the variety of movement options and, in later iterations, the defensive options available to characters being attacked. Super Smash Con has set itself apart from the regular tournament scene with events like the Combo Contest. While the scene is dominated by Super Smash Bros. Melee, the players invited to participate in this unique showcase stole some of that spotlight for themselves, showing that even the Smash release that started it all has a lot to offer fans of high-level play and tight execution. For more combo craziness, be sure to check out the full event archive courtesy of VG Bootcamp.